An international team of reseachers, affiliated with UNIST has sequenced DNA recovered from two 8,000-year-old human skeletons buried near the border of Russia and Korea. 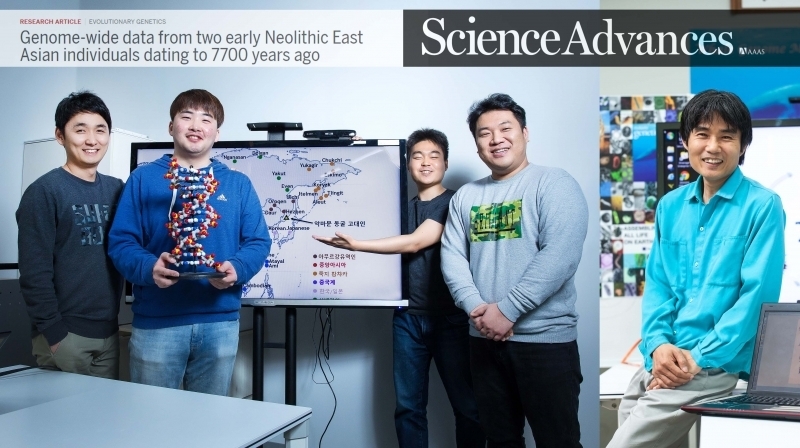 As the group reported today in Science Advances, a comparison of those sequences to modern populations in the region found that the Neolithic genomes were highly similar to those of the traditional Ulchi fishermen who live in the region, as well as to modern Koreans and Japanese. Genome analysis of human DNA from the Neolithic era has revealed for the first time that modern Korean people have genetic roots with an ancient people from the Russian far east and southern Asia, according to Ulsan National Institute of Science and Technology (UNIST), Wednesday. The Genomics Institute of UNIST’s biomedical engineering department, international archeologists, biologists and genome researchers from Britain, Russia and Germany have sequenced and analyzed the genome of female Eastern Asians who are estimated to have lived some 7,700 years ago. Two 7,700-year-old Stone Age East Asian skeletons are very similar genetically to modern populations in the area, according to DNA analyses. The work, carried out by mathematical biologist Veronika Siska from Cambridge University in the UK and colleagues and published in Science Advances, suggests that the transition from hunter-gathering to farming took a very different – and much more peaceful – course to that in the better-studied regions of western Eurasia. Heralding from Devil’s Gate – a Neolithic cave site on the border between Russia and Korea – the remains of a pair of Stone Age women enabled one of the first studies of the genetics in the region at the time. Their DNA samples were collected from a cave named “Devil’s Gate” in eastern Russia, north of the Tumen River. The research is the world’s first analysis on an ancient genome collected from East Asia, UNIST said. The research team compared the Devil’s Gate cavemen’s genome to those of multiple Asian modern day ethnic groups. Consequently, they discovered that a genome combination of the ancient Devil’s Gate cavemen and indigenous people of Vietnam and Taiwan best matched Koreans. Jong Bhak, a biomedical engineering professor at the Genomic Institute who led the research team, said Koreans’ genetic roots have been created from the mix of northern and southern Asian races. Proportionally, actual genetic composition of modern Koreans is inclined to southern Asians because the people in the south thrived on agriculture compared to northern races that had mainly lived on hunting and gathering, he added. Bhak also said East Asians including Koreans had a greater internal identity compared to other ethnic groups worldwide. The research revealed that the humans who lived in the Devil’s Gate cave had genetic traits including brown eyes and shovel-shaped incisors, like Koreans. They also had typical genetic distinctions and variations of modern East Asians such as inability to digest milk, vulnerability to high blood pressure, relatively odorless bodies and dry earlobes. This shows that modern East Asians have better preserved genetic traces of their ancestors for thousands of years, compared to modern western Eurasians who have lost genetic signs of their ancestors through more migration and warfare, the research team said. “East Asians have preserved genetic continuity in each ethnic group without an inflow of outsiders for at least the last 8,000 years,” said Jeon Sung-won, a researcher at UNIST Genomic Institute. According to the research, the humans who lived in the Devil’s Gate cave were the ancestors of the Ulchi people. As a minority race, they live in Far East Russia and spoke a Tungusic language. Except for the Ulchi people, Koreans turned out to have a similar mitochondrial genome type to ancient humans. The research has been published in the Feb. 1 edition of international scientific journal Science Advances, UNIST said.